There's not much in this world I love more than the combination of cheese (preferably melted) and carbs.... pizza, pasta, burritos, enchiladas, sandwiches, cheese plates, you name it. The possibilities are endless. Now that I'm pregnant I'm craving this combo more than ever and am always seeking out new combinations. So imagine my excitement when my friend Tara emailed me about a delicious grilled cheese sandwich she's currently obsessed with. We've had enough conversations about food (is there anything better to talk about in this world?) that she knew I'd love it. She discovered it at the new Oddfellows Cafe in Seattle, then re-created it at home. I made it tonight and it was deeeeeeeeeelicious. Can't wait to make it again. Gruyere cheese - I used a Swiss Gruyere and Gruyere Emmi Kaltbach (cave aged). I just got the two they had at my local grocery store. Butter the outside of your bread. Spread jam on the insides of each piece. Top one piece of bread, jam side up, with caramelized onions, gruyere, and a few dollops of goat cheese. 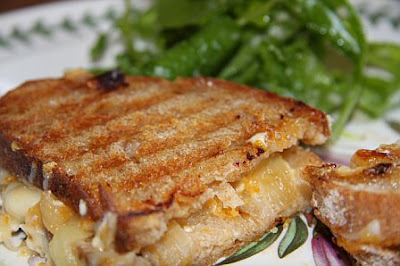 Top with the other piece of bread and grill as you would a normal grilled cheese (in a pan or on a panini grill). * Tara used cheddar and port salute cheese and said it was great so whatever you've got would work. 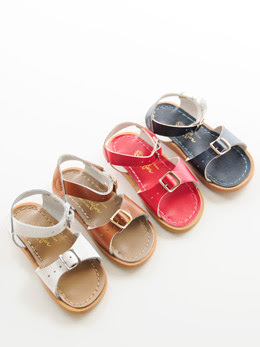 Salt Water Sandals on Sale! Olive Juice is having a sale on shoes including the Original and Surfer Salt Water Sandals. They are on sale for $26.95 which is the lowest price I've seen online. Check out these and other cuties like the Classic T-Straps by Aster at Olive Juice. 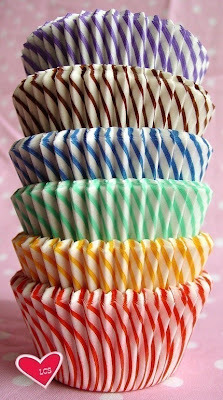 Cupcakes seem to be all the rage right now so there's lots of fun ideas and products popping up on the blogs. 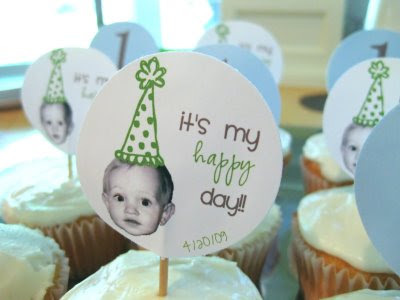 I especially love all the themed birthday parties with cute cupcake toppers. Too many cute ones to keep track. Here are a few things I've come across recently that I thought were worth posting. I was just catching up on my blogroll when I came across this post about smoothies on Design Mom. It actually tripped me out and I thought for a split second that my blog was somehow featured. I know, silly me for getting my hopes up. Anyway, check it out... smoothies, green smoothies and smoothie pops are all the rage right now! Time to get yourself some of those cute popsicle molds! 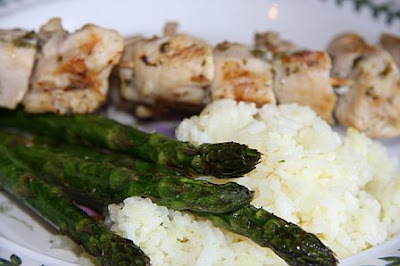 I make chicken souvlaki a lot in the spring and summer months. It takes a few minutes to prep, marinates all day, and cooks really quickly on the grill. I served it last night with butter rice, grilled asparagus and an arugula salad. It was the easiest four course meal, tasted great and I never even had to turn on the stove. My mother-in-law's delicious trick. Cook white rice (I use Niko Niko Calrose Rice in a rice cooker) then toss with a few tablespoons of butter and some chicken bouillon. I could eat asparagus everyday when it's in season so it's my veggie of choice right now. I don't know that I could ever get sick of it. Toss with olive oil, kosher salt and pepper. Cook on the BBQ for a few minutes and voila - delicious! Also in season so I'm sucking it down on a daily basis. Mix 2 tablespoons olive oil, 2 tablespoons white balsamic, 1 teaspoon maple syrup, salt & pepper in a small jar (I save old Dijon jars for this purpose). Shake really well. 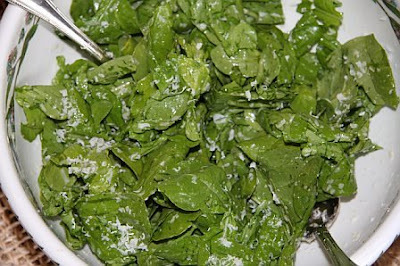 Toss arugula with some dressing and freshly grated parmesan. Even my daughter gobbles this up. Combine all the ingredients in a large bowl or ziploc bag and let marinate all day (stirring or shaking up from time to time if you think about it). Soak skewers in water for 20 minutes so they don’t burn on the grill. Put chicken pieces on skewers and grill on the BBQ for 10-15 minutes. * You can ask the guys at the meat counter if they will cut up the chicken for you. If they aren’t too busy they're generally happy to do it. It saves time and I also hate working with raw chicken so it's a nice way around it. I thought these Norpro reusable clear bowl covers were worthy of their own post. They are basically little shower caps for your bowls and the best way to get away from plastic wrap in my opinion. 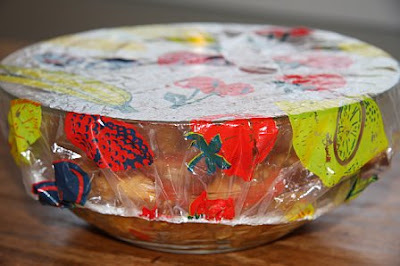 I like to store food in glass versus plastic (just a personal preference) so as I mentioned in my Earth Day post, I go through a lot of plastic wrap. These little covers are coming in so handy. I purchased them at my neighborhood PCC but I'm sure you can find them at large grocery store chains as well. 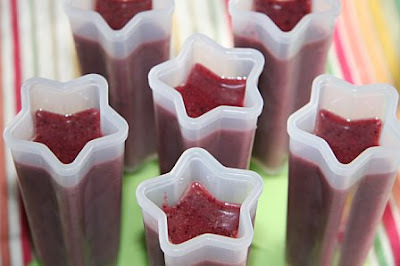 My friend Tara made smoothie popsicles and said her daughter loved them. I'd never thought of that. What a great idea for a healthy treat. I would much rather give my girl that type of popsicle versus a traditional one that's got no nutritional value. 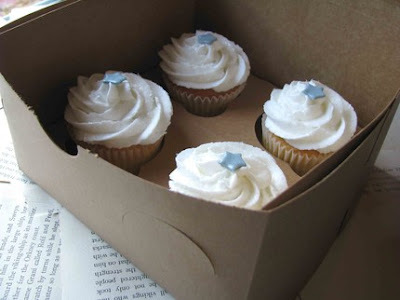 So, I ran out and bought some Tovolo Shooting Star Pop Molds at a local cooking store (Mrs. Cooks) and whipped up a batch this weekend. My daughter loves smoothies and always gets so excited when she sees me getting out the blender so I know these smoothie popsicles (or "moonie copickles" as she calls them) will be a hit. They take no time to make and the possibilities are endless. Use any combination of fruit, milk, juice, yogurt, honey, you name it. And speaking of smoothies, I came across this YouTube video on How to Make a Green Smoothie. I don't know why we're all not doing this more often..... daily actually. It's so easy, they taste good and they are so good for you. The video inspired me to get back into the habit so I made one first thing this morning. Such a great way to start the day. And if you can get your kids to eat them, what a fab way to sneak in all those greens. When I was pregnant with my daughter, my friend Ann sent me a list of all the things I would need for the baby. She received the list from a friend and added her own comments and suggestions. The list was so helpful that I have been keeping it up, adding my favorite items as well as recommendations from other people, and sharing it with friends when they become pregnant. It's a gem (email me if you want a copy!) and so nice to have a complete checklist as you buy baby gear or receive gifts. One thing I added to the list is a Patemm diaper changing pad. I have one and love it. I keep ours in the diaper bag and it comes in handy when I'm changing my little one in the car, at a friend's house, or in a restroom that doesn't have a diaper changing station. Even in restrooms with the diaper changing station, I still use my pad. It feels more sanitary to me. I've seen other brands of diaper pads but I really love the Patemm pads because of the round shape, the way the straps hold it together, the two size options and the easy-to-clean fabric. They also come is a variety of cute patterns. If you're pregnant or a new mom, add this to your wish list. I've always loved having this little gadget in tow. My friend asked if I had a produce calendar so she'd know what's in season in Washington throughout the year. 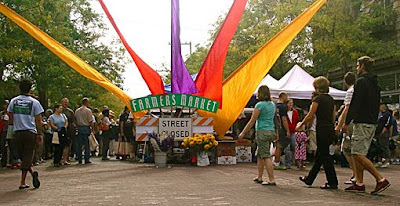 Check it out to see what's in store for you each month at the farmers markets. Exciting stuff in the next few months. If you don't live in Washington, you could easily track down a produce calendar for your area on Google. I was also craving pasta and thought a meatless night was in order after two nights of chicken. I've been on an asparagus kick and had all this goat cheese from the market so I googled for a recipe and found this Pasta with Goat Cheese & Roasted Asparagus recipe. Perfect pasta to go with my salad. Line a baking sheet with foil. Preheat the oven to 450 degrees F. Whisk the vinegar, shallots, and honey in a medium bowl to blend. Gradually whisk in the oil. Season the vinaigrette, to taste, with salt and pepper. Toss the cooked beets in a small bowl with enough dressing to coat. Place the beets on the prepared baking sheet and roast until the beets are slightly caramelized, stirring occasionally, about 12 minutes. Set aside and cool. 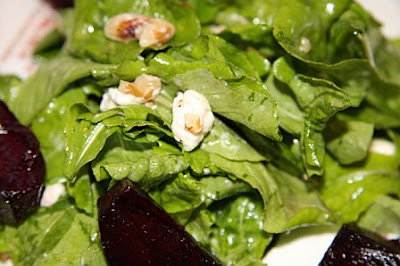 Toss the arugula, goat cheese and walnuts in a large bowl with enough vinaigrette to coat. Season the salad, to taste, with salt and pepper. Mound the salad on plates. Arrange the beets around the salad and serve. I've changed a lot in the last few years and one of the biggest things is my awareness of the environment and my effect on it. I know the changes I've made in my daily life are not that significant, but as Gandhi says, "Whatever you do will be insignificant, but it is very important that you do it." So here are a few of the things I do to lessen my impact on the environment, and they are all such easy changes that it's hard not think everyone should do it too. As I mentioned in a previous post, when I buy something at a retail store, I never take a bag. Generally you can shove a t-shirt or book in your purse or stroller so why take the bag? Or if I know I'm going shopping, I'll bring my own cloth bag or shopping bag from home. I almost always bring my own bags to the grocery store (except when I need a few paper bags for recycling). If you aren't in the habit of doing this already, it's a great place to start. After you unload the groceries, put the bags by the back door and they're ready to go the next time you head to the car. In addition, I've become much more aware of the plastic that I buy, and I re-use all the plastic containers that food comes in. For example, a small sour cream or cream cheese container is perfect for snacks for your kids when packing a lunch. Use them for fruit, crackers, trail mix, you name it and it's one less plastic bag out the door. I am also a leftover-oholic so I always make extra food to eat the next day for lunch. I generally use our regular plates and bowls and use plastic wrap or foil over the top which I always feel bad about. Well I just discovered Norpro reusable clear bowl covers. I love them! I bought a set of 6 bowl covers that come in a range of sizes from 3" to 10". Perfect for all the bowls of leftovers I am constantly shoving into my fridge. This is going to significantly reduce how much plastic wrap I use on leftovers. These are just a few of the things we've instituted in our house, along with eating less meat, being psychotic about recycling, switching over to compact fluorescent light bulbs and being more aware of the energy we use. That said, I am always eager to learn more so please post your ideas and simple changes you've made to be more environmentally friendly. 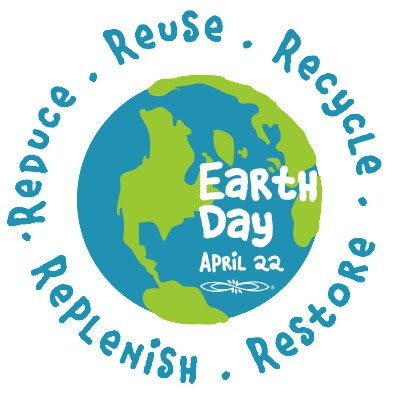 Thanks for any ideas and Happy Happy Earth Day! My friend Whitney is a great resource for easy, good food. She has a really laid back approach to cooking and rarely measures anything out. She is the mastermind behind the lentil soup with chorizo. She just whipped that up one day with whatever she had in the house and now it is one of my all-time favorite soups. The other night she invited me over for dinner and I quickly accepted. She made BBQ chicken with a delicious homemade sauce. It wasn't your typical super-sweet BBQ sauce and it had a nice zing to it (from the Worcestershire sauce I imagine). She served it with baked beans and brown rice. I brought my favorite salad along and it was a perfect dinner. Being the crazy person that I am, I made it for my family a few days later and we had leftovers the following night too. The beauty of this dinner is that in the time it takes you to cook the brown rice, you can make the marinade, BBQ the chicken, heat the beans and even roast some asparagus. Four courses in 45 minutes. This dinner is a keeper. I used three chicken breasts and made two batches of the sauce - one for the chicken and one to use for drizzling. When it comes to sauce, my motto is "better too much than too little". Heat olive oil in a small sauce pan over medium heat. Add onion and saute for 5 minutes. Add garlic and saute for a few more minutes. Add wine, ketchup, A1, Worcestershire sauce, sage and pepper. Bring to a boil. Reduce heat and cook for 5 minutes. Pour all but a small amount over chicken and let sit for 5 minutes. BBQ chicken on the grill. When you flip the chicken, slather it with more sauce. Drizzle the extra sauce (not the sauce that touched the raw chicken) over rice or the chicken. Serve with baked beans, brown rice, a grilled veggie or green salad. I also LOVE Blabla stuffed animals. I would buy every one of the dolls if I could. I love how bright and colorful they are and get a kick out of the goofy designs. 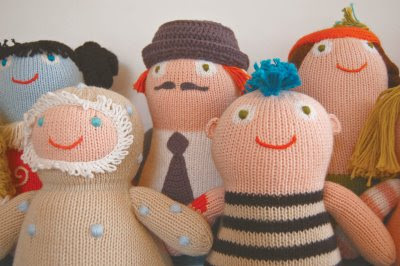 The Blabla collection includes hats, sweaters, tees, finger puppets, dolls, rattles, backpacks, mobiles and blankets. These little lovies are available online through their own online boutique as well as other online retailers. And once again Seattleites, check out Stuhlbergs on Queen Anne for these awesome toys. They make the best gifts. Blabla's collection is designed by Florence Wetterwald and knitted by Peruvian artisans. 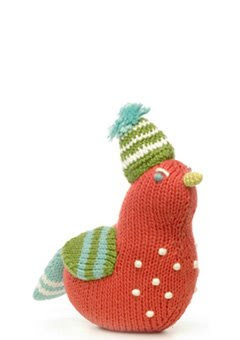 Everything is made from natural fibers of exceptional quality grown in Peru, making the line irresistibly soft & cuddly. Florence's poetic, simple, and vibrant style combined with the ancestral knowledge of the knitters has created products which look contemporary yet feel like old friends. 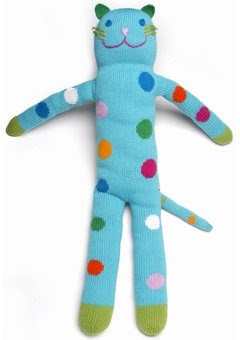 I'm a big fan of Jellycat stuffed animals. They offer a huge assortment of animals that are all so cute and well made. I'm a sucker for bunnies and they have quite a few cute ones. Gosh, I should have posted these little bunnies before Easter. 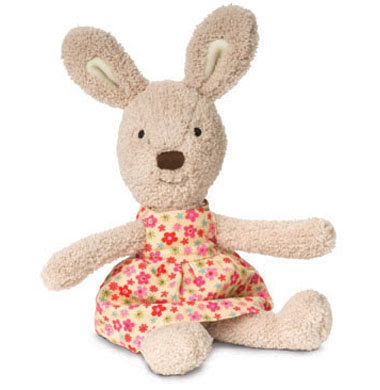 Jellycats are sold online through multiple retailers and are also sold at toy stores and boutiques so keep an eye out. If you live in Seattle, check out Stuhlbergs on Queen Anne. 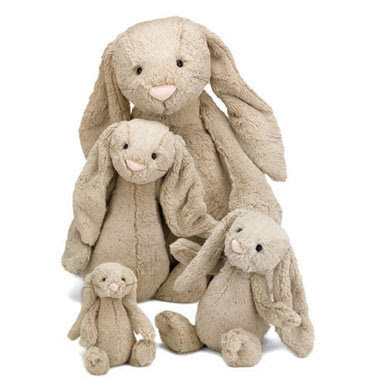 Stuhlbergs has a great collection of Jellycats as well as lots of other great stuffed animals, toys, clothes and books for kids. It's my go-to place for baby gifts. 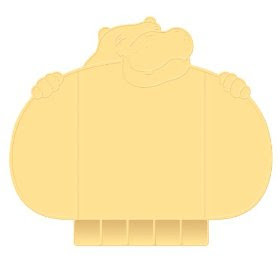 What pregnant woman or new mom wouldn't love a few of these to decorate the nursery?! 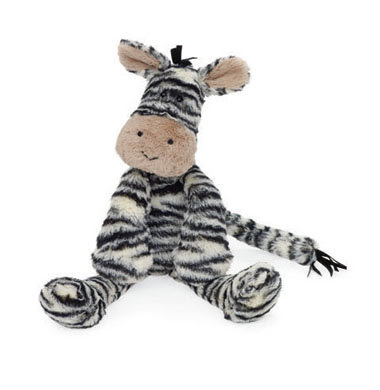 How cute is this zebra?! I'm a big fan of the blog Everybody Likes Sandwiches. Although I haven't made many of her recipes, I've loved the few I tried, and am dying to try others.... lemon yogurt hotcakes, lemon waffles, baked oatmeal with apples. Yum! 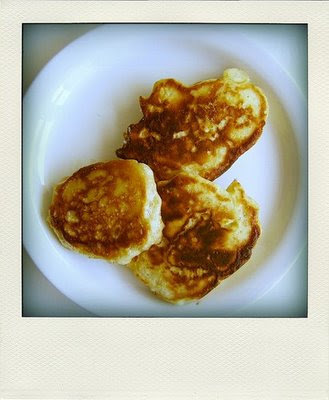 I'm crazy for her orange ricotta pancakes and make them regularly. I especially like the tip about serving them with sour cherry jam. So tasty and you don't even need syrup. She has an extensive lineup of recipes and I am always drawn to her delicious breakfast ideas. For someone who never ate breakfast, unless it was chocolate, I have grown to love the first meal of the day with all the sweet concoctions you can create. Thank heaven for blogs! Sophie the Giraffe has some little mushroom-shaped buddies available called Chan Pie Gnon. 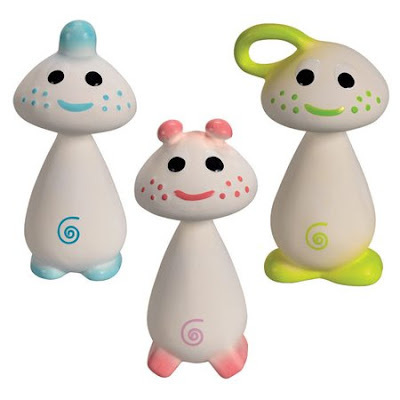 These are wonderful, easy to grip teethers made from BPA and phthalate-free natural rubber. Love 'em! The other night I was craving something light and fresh for dinner. A crisp cold salad was just the thing to capture my heart. I made the most delicious chicken caesar for dinner and had extra fixings for the next two day's lunches. I bought two bone-in, skin-on chicken breasts and cooked them "Ina-style" (olive oil, salt & pepper, bake at 350 for 35-40 minutes). I stored them in the fridge and each day when I was ready for my salad I would cut some strips of the chicken and warm it in the oven. I turned the oven to broil to give them a little crisp to the edges and it heats them up quickly. Next you can get a head or two of romaine and get it all prepped and ready (washed, spun and ripped up, then store in large Ziploc bags with paper towels to pull the moisture). I like to prep it the day I buy it and then it's ready to go when you need it. 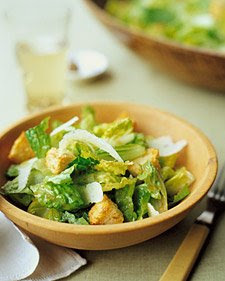 Toss romaine with a homemade caesar or good store-bought dressing. If you live in Seattle, I highly recommend the caesar dressing from Pasta & Co. It's awesome. I always drizzle my caesars with fresh lemon juice and freshly ground pepper. It makes a store-bought dressing taste better. Also toss with some freshly grated or shaved Parmigiano Reggiano. And finally, great croutons are a must. You can make your own or find especially good ones in the bakery section of the grocery store (rather than the boxed ones). If you live in Seattle Grand Central Bakery has the best caesar croutons. I love this meal on a hot day or when I want something easy and light. I've been buying arugula at the farmers market the last few weeks and it is one of my most favorite things to eat. I just love the uniquie and peppery flavor. It's great in a salad, on sandwiches, burgers or pizzas, with chicken paillard, with steak or beef carpaccio (one of my favorite things on earth) or you can even make arugula pesto with it. So many options. I especially like to toss arugula with olive oil, lemon juice, freshly shaved Parmigiano Reggiano and pepper for a quick salad. It's so easy and good. Here are a few of my other favorite ways to eat this delicious little leaf. My friend Lynne found this great recipe for Grilled Halibut with Pesto & Arugula that is great. When halibut is in season and fresh I will make this a lot for a super quick dinner. You can make the pesto or buy a great pre-made one at the store. I like to serve the arugula on the side as described above. Great dinner in under 30 minutes. I love Ina's Lemon Fusilli with Arugula. It's a great pasta salad to serve for dinner in the summer or as a side dish for an outdoor BBQ or casual dinner gathering. 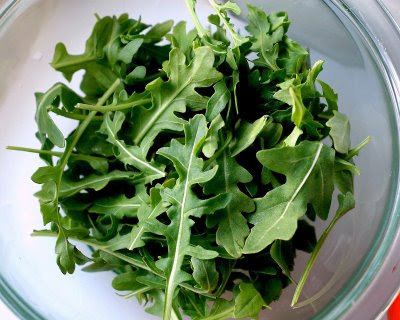 Arugula looks like a kind of lettuce, but it is a cruciferous vegetable in the same family as broccoli and cauliflower. Like its cousins, it has many of the same potent health benefits. Arugula is rich in phytonutrients, which may reduce the risk of several kinds of cancer, including breast, stomach and colon. It also contains small but helpful quantities of other compounds: One cup delivers 5 percent of the RDA for vitamin C and 3 percent of the RDA for calcium—and contains just 5 calories. A Crewcuts store (JCrew's children's collection) is opening at our local outdoor mall and I cannot wait. My daughter is still too little for Crewcuts but she's growing like a beanstalk so we're just months away. I thought I would take a quick peak and see what's in store for us. I love all the basics as I'm a sucker for my daughter in cords or jeans, a t-shirt and a little cardigan sweater. Funny enough, her uniform is quite similar to my uniform which is also jeans, a t-shirt and a cardigan sweater. Silly mommy. Anyway, here are a few of the items that caught my eye. Great basics and I love the bright yellow trench. I came across this photo on the wonderful blog Black Eiffel. 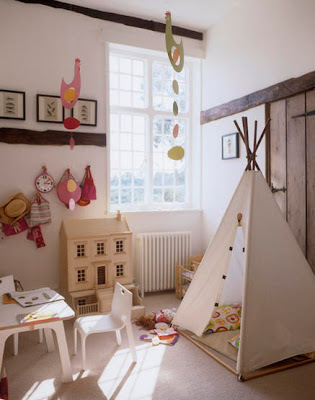 I think it is such a cute little playroom. Our playroom is also the TV room so it is not youthful or cute. I just revamped the bookshelves with childrens books to lighten it up a bit, but oh what I would give for an adorable playroom for my daughter (or for me really). The "terrible one and a halfs" have set in and since this is my first child, I'm finding myself in unfamiliar territory. I have a lot of friends who I admire as parents. I look to them for advice and always enjoy hearing how people handle tough situations. Just last night my friends and I discussed what a parent should do when they see a child being mean to their son or daughter. Do you step in, or let him/her stick up for themselves? I haven't hit that stage yet but I love hearing how my friends handle these tough calls requiring quick decisions. I've been hearing some great things about the "Love & Logic" philosophy. I've heard from several friends that they've taken the course and have had positive outcomes with this style of parenting. 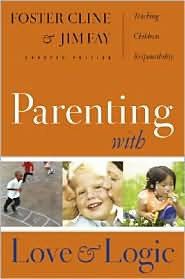 One friend said I should get the book before taking the course so I just ordered the latest edition and look forward to learning some great strategies to use as my daughter graduates from the "terrible one and a halfs" to the "terrible twos" and beyond. Stock or Broth: What Did I Make? My friend Lynne and I are always wondering what the difference is between stock and broth. Now that I've entered the club of people crazy enough to stock their freezer full of it, I figured I should know which one I made. So I did a little googling and the difference has to do with whether you use meat or just the bones. The term "broth" defines liquid made by boiling meat while the term "stock" defines liquid made by boiling bones or inedible parts. Vegetables can be used in both to enhance the flavor of the liquid. Generally you can substitute one for the other but broth is said to taste better if served on it's own. "Though the terms that describe stocks are sometimes used interchangeably, the distinctions are useful to understand as you start to cook. A stock (with the exception of vegetable stock) is made of water simmered with bones. The meat on them provides flavor while the bones, and the gelatinous connective tissue between them, slowly break down and add body to the liquid. A broth, on the other hand, is usually made with just meat (or bone-in meat, such as a whole chicken) and/or vegetables; it is typically lighter bodied and served on it's own." Well there ya have it... I made broth. We had some friends over for dinner this weekend and they have two young girls (a first grader and a third grader). I didn't want the girls to be bored at our house so I created our dinner menu with them in mind. We served a build-your-own pizza bar and let the girls roll out the dough for all the pizzas. I think they enjoyed that and liked making their own individual pizzas with the toppings of their choice. After dinner we switched the kitchen over to a build-your-own banana split bar. The girls were even more excited to make those and the adults enjoyed the finished product just as much. I can't remember the last time I had a banana split and I'm not sure why I'm not eating them more often (except for the obvious reasons). It was delicious. Really, what's not to love about banana topped with ice cream, chocolate sauce, spanish peanuts and whipped cream? I got my hands on some Mama Lil's Peppers and they are the topping of choice in our house now. I did a version with the peppers and goat cheese. YUM! It's also great with sausage, olives, and mushrooms. My husband and I are crazy for the spicy peppers. We had tons of extra toppings so we did pizza night again tonight. I still have some great toppings so we will be using leftover english muffins (from our mcmuffin breakfast) to make pizzas for lunch one day this week. As long as we're spending top dollar for groceries these days, you need to be resourceful in using them all. I used to be really wasteful with food and I've done a 180 for so many reasons. So, english muffin pizzas it is. I always loved them growing up so we'll see how they turn out. Asparagus is definitely my favorite vegetable so I get really excited this time of year. It's asparagus season. Yay! I loved reading the chapter devoted to asparagus in Barbara Kingsolver's Animal, Vegetable, Miracle. It made me all the more excited for asparagus season this year. I've been getting some from California the last two weeks at the grocery store and I can't wait to get my hands on some local asparagus at the farmers market. Preparation: Snap the stems where they naturally break to remove the woody bottom portion. When asparagus is in season and tasting great, you really don't need to do much to it. Toss with a little olive oil, kosher salt and pepper and throw it in the oven or on the grill and it always turns out great. It is also great with a lemon sauce or dressing, balsamic vinegar or hollandaise sauce drizzled over the top. Here are two of my favorite asparagus recipes that I learned from my uncle and mother-in-law, respectively. Both are fabulous. Blanche asparagus in a pot of salted boiling water for one minute. 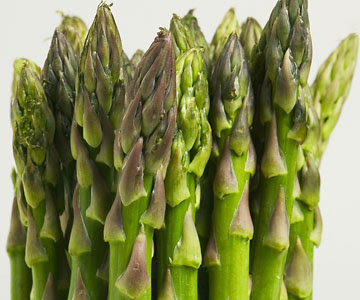 Drain and place asparagus in a large ice bath to cool down. The blanching can be done ahead of time if necessary. Heat butter and soy sauce in a medium saute pan. Add asparagus and cook for a few minutes tossing to coat each spear with the sauce. Be careful not to overcook asparagus. Transfer to a platter and sprinkle sesame seeds on top. Boil water and cook asparagus for 2 minutes. Let cool. Mix other ingredients together to make dip. 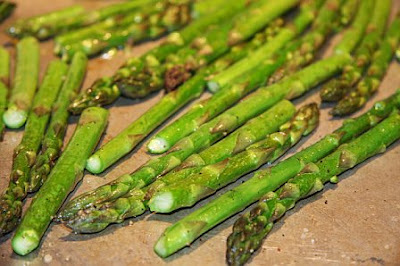 Serve asparagus cold or room temp with sauce. I really can't discuss good food items without having to track it down or fix it within days, if not hours. (I'm like this even when I'm not pregnant!) At a children's play group on Friday my friends and I were talking about fried egg sandwiches and homemade egg mc-muffins so no surprise that I ran to the store last night for all the ingredients and made them this morning. Homemade ones are so quick and easy. Preheat the oven to 350 degrees. Place the sliced canadian bacon on a cookie sheet and top with cheddar cheese slices. Throw the cookie sheet in the oven while you cook the eggs and toast the muffins. Everything is ready to assemble within minutes. I like to put mustard and mayo on mine. I know that may seem weird to some people, but once you try it it's hard to eat it any other way. Washington apples are still tasting great but I think they're almost done for the year so time to bake up some last minute goodies. Instead of a birthday cake my husband requested an apple crisp so I made Ina's Old-Fashioned Apple Crisp earlier this week. It was delicious served warm with Molly Moons vanilla ice cream (which is always worth the wait by the way). Heaven on earth! You could probably make this recipe in individual ramekins like her Pear, Apple and Cranberry Crisp. That always makes a cute presentation. I am a HUGE fan of these Kiddopotamus Tiny Diner portable placemats. 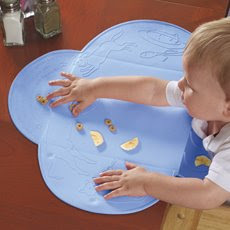 When we were first going out to dinners with my daughter in a highchair, we used the plastic disposable placemats that stick to the table but my daughter quickly learned how to rip them off. They were not a success. When we found the Tiny Diner placemats we were sold. It has little suction cups on the bottom that help it to stick to the table really well. It's made with FDA compliant materials - no lead, PVC, BPA, phthalates or latex. It has a little lip on the edge to catch food that falls to prevent everything from landing in their lap. What more could you ask for? When we leave a restaurant we just fold it up with all the crumbs and everything and throw it in a plastic bag to take home and wash. I hate leaving a big mess at a restaurant so I'm always wiping up the table and floor and this makes it much easier. I highly recommend this for families who have little ones and like to eat out. 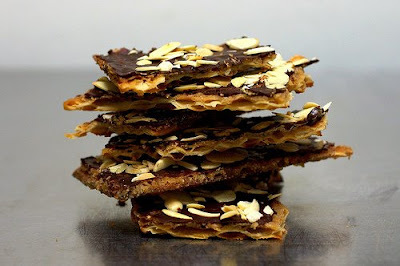 Do I dare make these chocolate caramel crack(ers) from Smitten Kitchen? If they live up to their name, it could be trouble for me being pregnant and all. The last thing I need is another sweet to crave day in and day out. But they look SOOOOOO good. I might have to make them.... tomorrow. 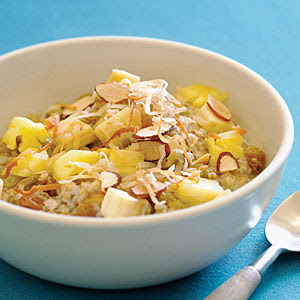 I pulled this recipe for Aloha Oatmeal out of Sunset magazine in January. I made it this morning and it was delicious. Everything in it is really good for you too! My daughter even gobbled it up which surprised me. I thought the coconut and almonds might scare her off. I made extra of everything this morning so tomorrow's breakfast will be ready as quickly as I can re-heat the oatmeal and add the toppings. On another note, I'm horrible about drinking water. When I was in college I could go days without taking a sip (so bad for you!). I still struggle to get enough so I put some pieces of the chopped pineapple in a large pitcher of water and let is sit for several hours yesterday. It was so much better than plain water and I drank the whole thing. I made another batch for today and am excited about my new strategy to hydrate. When I'm sick of the pineapple I might try orange slices or cucumber. 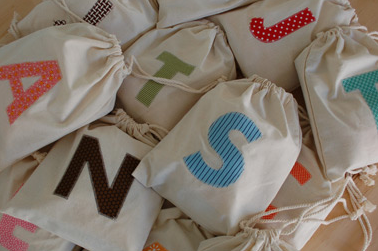 I just came across these adorable goodie bags from Lovely Designs via Oh Happy Day. Lovely Designs provides instructions on how to make your own. 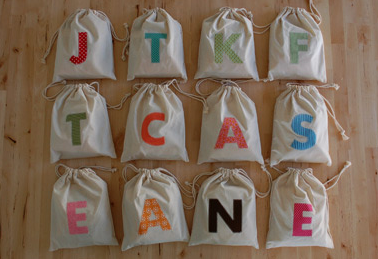 Super cute party favor bags for a birthday party. I love the new collection from Flora & Henri. 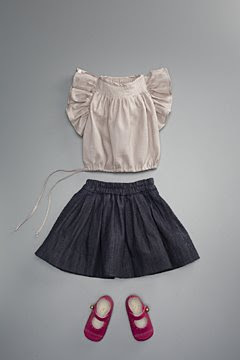 This outfit could not be any cuter. I've been on a bit of a bacon kick ever since finding that delicious bacon at the farmers market. I bought more this weekend and needed a new and delicious way to eat it. 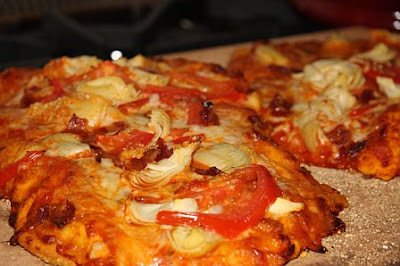 My husband suggested pizza night for dinner and since bacon was on the brain, I was reminded of a delicious pizza my friend Stephanie made once using bacon, artichoke hearts, fontina cheese and tomatoes. She makes it on Boboli but I used store-bought pizza dough tonight. Either way you go, it's delicious! Place pizza stone in the oven and preheat to 500. Sprinkle a work surface, rolling pin and pizza dough with flour and roll out dough to thin pizzas. Sprinkle a flat cookie sheet with cornmeal (to prevent the dough from sticking) and transfer rolled-out dough onto it. Brush with olive oil. Top with pizza sauce, equal parts of each cheese, then the bacon, artichoke hearts and tomato slices. Carefully remove pizza stone from oven and reduce heat to 450. Sprinkle pizza stone with cornmeal and then slide pizza onto the stone. Bake for 10-15 minutes. Remove and carefully transfer to a wood cutting board to slice. Bon appetite! I recently heard my crush, Michael Pollan, and Mark Bittman, author of Food Matters, speaking on KUOW. Right as I was about to change the station I heard a few words in a familiar voice and knew it was Michael Pollan so of course I tuned it. As always he had a lot of interesting things to say. Next up was Mark Bittman. I hadn't heard him speak before but had just ordered his book so I was eager to hear what he had to say. Among other things he explained that with some basic supplies in your pantry and fridge, you could feed your family in less time and for less money than it would take to go to McDonalds. The price of food is quite expensive, and cooking can be quite the chore if you don't enjoy it, but he gave some pointers on what to have on hand to whip up a quick, healthy, inexpensive dinner. I did a little googling to get my hands on the list. I also found a great article in The New York Times Dining & Wine section, "Fresh Start for a New Year? Let’s Begin in the Kitchen," where he provides a great list of things to ditch and things to buy. Grains: Mostly whole; include rice, cornmeal and whole-grain flours. Once you figure out which grains you like, buy them in bulk and keep some in the cupboard and some in the freezer. Beans: Choose an assortment of dried beans, but not more than you can use in a few months. Canned are fine but more expensive with less selection, and do not taste as good. Olive oil: Your go-to oil, extra-virgin in almost every case. Country of origin does not matter; price does. The $10-a-liter stuff is perfectly fine. Other oils: Something neutral for cooking Asian-style dishes or pan frying at high heat, such as grapeseed, sunflower or peanut. The key is minimally processed, high-quality, cold-pressed oil, when possible. Staple vegetables and fruits: These include much-used seasoning varieties, such as onions and garlic; frozen vegetables including spinach, peas and corn; and fresh vegetables, which you have to buy at least a couple of times a week. Long keepers such as carrots, potatoes, celery, lemons and limes can be replenished as you use them. Fresh herbs: Something as simple as parsley can make all the difference in a dish; almost all herbs, especially basil and mint. Dill, rosemary, thyme and cilantro are great to have around too. Spices: As varied an assortment as your space and budget will allow. Vinegar: Bittman thinks sherry vinegar is the best value because it is the most versatile; balsamic is more popular but sweeter. Well-made red and white wine vinegar are good. 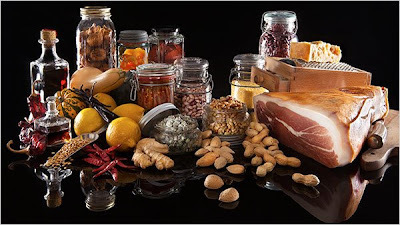 Dried fruits and nuts: For snacking and cooking, plus sesame and sunflower seeds and nut butters. 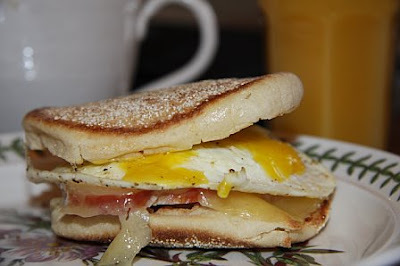 Meat, dairy and cheese (mostly for flavoring, used sparingly): Parmesan, bacon, butter and eggs. Canned tomatoes: Plum tomatoes are best; chopped tomatoes make life easier. Avoid those with additives. Today's GOOP newsletter is right up my alley. In case you don't already get her newsletters, here it is. It's worth reading! A couple of years ago I was asked to give a quote for a book concerning environmental toxins and their effects on our children. While I was reading up on the subject, I was seized with fear about what the research said. Fetuses, infants and toddlers are basically unable to metabolize toxins the way that adults are and we are constantly filling our environments with chemicals that may or may not be safe. The research is troubling; the incidence of diseases in children such as asthma, cancer and autism have shot up exponentially and many children we all know and love have been diagnosed with developmental issues like ADHD. Perhaps it is a coincidence, but perhaps we can do things to reduce illness in our children and ourselves. Below you will find some of the most prevalent facts and also easy, affordable ways to reduce exposure to substances which may be harming us. Our children are our future. Our sacred responsibility as parents, grandparents and elders in society is to do all that we can to protect our children’s health, to ensure they reach their full potential and to empower them to be happy, productive and caring individuals. Asthma incidence has nearly tripled in the past three decades. It is the leading reason children are admitted to hospitals and the leading cause of school absenteeism. Cancer, after injuries, is the leading killer of children in the United States. Leukemia and Primary Brain Cancer have increased in incidence – brain cancer by nearly 40 percent in the past three decades. Developmental Disabilities are now commonplace, with ADHD, dyslexia, other learning disabilities and mental retardation affecting one of every six American children. Birth Defects such as hypospadias, a birth defect of the reproductive organs in baby boys, have doubled. Autism is now diagnosed in one in every 150 American children. Childhood Obesity has quadrupled in the past ten years. Type 2 Diabetes, previously unknown among children, is becoming epidemic. And that’s just the tip of the iceberg. To me, as a pediatrician and epidemiologist, these increases in the rates of chronic disease in our children are a stark warning that something is going very wrong. Many toxic chemicals are known to contribute to these diseases. They deserve special attention because most are preventable sources of harm. Children are at risk of exposure to 80,000 chemicals, 3,000 of which are high-production-volume synthetic chemicals produced in excess of one million pounds per year. Nearly all of these are new chemicals developed in the past 50 years and never before seen on the face of planet earth. These chemicals are used widely in consumer and household goods like personal care products, cleaning supplies, pesticides, paints, toys, home furnishings, carpeting and electronics. Most disturbing to me as a doctor is that nearly 80 percent of these chemicals have never been tested for toxicity or examined for their potential to damage children’s health. We must understand an important fact: Children are especially sensitive to environmental toxins. They are much more vulnerable to toxic chemicals than adults. Pound for pound of body weight, children have greater exposure to chemicals because they drink more water, eat more food and breathe more air than adults. Children’s unique behaviors put them at higher risk. They live and play close to the floor; and they constantly put their fingers into their mouths. Children’s metabolic pathways, especially in the first months after birth are immature. Generally they are less able to metabolize, detoxify and excrete toxicants than adults and thus are more vulnerable to them. Children are undergoing rapid growth and development, and their developmental processes are easily disrupted. From conception and throughout fetal development, toxic exposures can cause permanent impacts. Since children have more years ahead of them than most adults, they have more time to develop chronic diseases that may be triggered by early and repeated exposures. In addition, we’ve learned that if a young child who is still developing (unlike an older child or an adult) is exposed to toxins like lead or pesticides during a critical early window of development, this exposure can affect their health for years to come. In fact, many prenatal exposures have a larger impact on the health of a fetus than on the health of the mother. The growing brain is an organ that is especially sensitive to toxins. Scientists are also extremely concerned about the newest animal research which suggests that chemicals can alter gene expression in cells throughout the body. In essence, repeated chemical exposures during early development can change how genes function and subsequently increase the likelihood of disease. Suspicion is rising that toxic exposures during moments of heightened susceptibility in early life can cause disease and disability in childhood and possibly contribute to diseases such as Alzheimer’s or Parkinson’s disease later in life. Tests for developmental effects are not routinely required before a chemical is used in everyday products. What can you do to protect yourself and your children? My advice is that you take simple steps to reduce your exposures to toxins and chemicals in the environment, and that you work together with other parents in your communities to push for safer alternatives where your children live, eat and play! Dr. Philip J. Landrigan is a pediatrician and the Ethel Wise Professor, Chair of the Department of Community and Preventive Medicine; Director of the Children’s Environmental Health Center at Mount Sinai School of Medicine. He is a Founding Board Member of Healthy Child Healthy World. It’s hard to get those recommended seven to eight hours of sleep a night. Five days of exercise would be the greatest luxury. Your leisure reading pile consists of books like Goodnight Moon and Pat the Bunny. But your sacrifice is for the best smile and hug in the world – from your child. Welcome to parenthood. Yet, we are a new generation of parents. We strap helmets on our kids as they skateboard and bike, we strain our necks putting on outlet covers, but there are new realities when it comes to keeping your children safe and healthy. 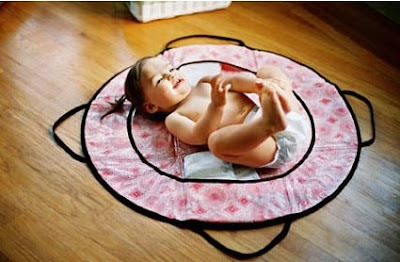 Parents are beginning to understand that protection from harmful chemicals in everyday products is equally important. For example: hormone disruptors in baby bottles, toxins in cleaning products and pesticides on strawberries. The good news is that you can do something today about these chemical hazards in your homes, and be, as my grandmother often said, “better safe than sorry.” There are many easy nontoxic solutions and precautionary measures (like that bike helmet) to prevent harm and ensure a safer, cleaner and healthier future for your children. And remember, no one can do everything but you can do something. Your children, your family and your planet will all thank you. 1. Eat intelligently. Organic foods are the best investment you can make for your child’s health. They can be more nutritious, sourced closer to home and are typically in season, but can cost a bit more. Prioritize wisely. Pediatrician Dr. Alan Greene recommends purchasing varieties of these organic foods in order to most effectively reduce chemical exposures: milk, potatoes, peanut butter, baby foods, ketchup, apples, beef, soy and corn. 2. Drink plenty of pure water. Bottled water is completely passé. It’s overpriced, unsustainably overpackaged, and not necessarily cleaner than regular tap water. Invest in a water filter (a simple pitcher option is fine) and a reusable stainless steel water bottle. Over time you’ll really see a big savings, plus you’ll be keeping countless plastic bottles out of landfills and oceans. 3. Embrace natural beauty. Ever read the chemical ingredients list on your shampoo or lotion? Not an easy task. Sixty percent of what goes on the skin is absorb into the body – so avoiding chemicals here is super important, especially for pregnant moms. You will reduce your family’s chemical exposure by opting for products made with natural and organic ingredients, like those from Care (Stella McCartney), California Baby, Perfect Organics, Aveda or Dr. Hauschka. Or you can even make your own! For a rich body moisturizer, combine ½ cup coconut oil with a ¼ cup cocoa butter and a few drops of your favorite essential oil. Protect your baby’s skin with a little olive oil, which also prevents rashes on his bum. At the first signs of redness, bathe your baby in warm water with a little baking soda or apply a small amount of aloe vera gel. 4. Detox your nest. Home cleaning products often have harsh chemical ingredients that require words like “warning” or “danger” on the label - totally at odds with maintaining a healthy home. Safely opt for effective, nontoxic cleaning products for laundry, surface, dish and bath – many are no more expensive than their conventional counterparts. I’m a fan of 7th Generation. Or go old school and clean the way our grandparents did with common kitchen ingredients. Baking soda is great for scouring. White vinegar diluted with water magically cleans windows and countertops (killing bacteria and odors, as well). The acid in lemon juice fights grease and mineral scum. 5. Breathe clean air. Many people associate the smell of bleach or synthetic air fresheners with cleanliness. But, the smell of clean is actually scent-free. According to the U.S. EPA, indoor air is typically two to five times more polluted than outdoor air, and most people spend 90 percent of their time indoors. In addition to using nontoxic cleaning products, just opening your windows for a few minutes every day to let in some fresh air will do wonders. Vacuum regularly with a HEPA filtered vacuum. Growing houseplants also helps filter and detoxify your air while bringing a bit of the outdoors in. Turn on the exhaust fan or open the window when showering and cooking at the stovetop with gas. Remember to clean and replace your heating and AC filters regularly – these trap the germs and chemicals you don’t want recirculated in your home. 6. Take playtime back to the basics. Having a child shouldn’t mean turning your whole house into a toy box. Kids are better off without piles of plastic play things, battery powered gizmos and all sorts of complicated gadgets that profess to make them smarter. Simplicity is better for your child’s imagination, intellect and health – and, yes, much better for the planet. Stick to toys made from natural materials like solid wood and organic textiles, and opt for nontoxic art supplies and recycled paper. Use items you already own as playthings, like cookware drums or sock puppets, and visit our website (www.healthychild.org) for a quick video on how to make homemade play dough. 7. Ban bugs and whack weeds using common sense instead of chemicals. Pesticides are harsh poisons designed to kill rodents, bugs and weeds. Pesticide residues can end up on your grass, in your home and eventually on your child’s hands (which every parent knows will end up in his or her mouth). Prevent pests by keeping your home clean and removing their source of food. 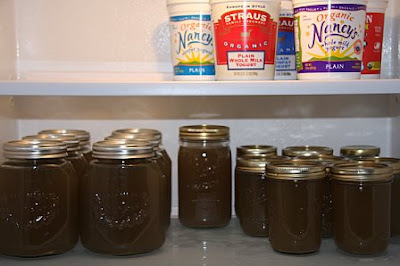 Distilled white vinegar will eliminate any weed. Be sure to wipe your feet on a doormat, or better yet, remove your shoes at the door to prevent tracking in dirt, dust, grime and other contaminants like lead or pesticides (and clean less!). 8. Go on a diet. I don’t mean cutting calories, but rather a diet from stuff. Reduce consumption. In the US, 90 percent of purchases end up in the trash within six months. We’re all familiar with the mantra “reduce, reuse, recycle” and while most people have embraced recycling, reducing is the first and best step. And it means saving money. You will also reduce your children’s exposure to unnecessary chemicals, consume less of the earth’s resources, and decrease the amount of pollution generated by manufacturing and disposing of all the stuff your family uses. Convert the money you save from scaling back on the purchases toward investments in the higher ticket green items like organic food, sustainable clothing and healthy furnishings. 9. Reuse, reclaim, repurpose, recreate, rethink. In the same vein as above, consider buying the things you need from secondhand stores, designer consignment shops, Craigslist, Etsy and eBay. You can host your own “swap your swag” night with your friends, or look for items on FreeCycle or similar swapping services. One person’s trash is another’s treasure, right? Give something old a new look with organic textiles or no-VOC paints and stains. For older children’s items, look into the latest safety standards and recalls at CPSC.gov. 10. Spread the word. Now that you have some information, inspire and empower others in your tribe. They will appreciate the information if you offer it as a good friend and parental ally. And if you are like me – unrelentingly self-critical – give yourself a break and know that each small step will help your family. Christopher Gavigan is the author of Healthy Child Healthy World and CEO / Executive Director of the nonprofit of the same name: www.healthychild.org. Jesse Johnson is the co-founder and CEO of Q Collection Junior, an eco-friendly and nontoxic line of baby bedding and furniture. GP: What is the ethos of Q collection Junior? Our children: Most baby furniture and bedding are made with paint, glues, wood and cotton that give off toxic fumes and contain harmful chemicals. Our materials don’t do either and are the only ones certified to ensure that your baby’s room will be free of indoor air pollution. Our communities: Our furniture is handmade in the USA. That means we’re creating jobs for people right here at home. Our planet: Just because your baby will be done with the crib one day doesn’t mean our planet will be. That’s why we use only biodegradable materials and packaging. And all of the wood for our furniture comes from within 150 miles of our factories. Using local wood helps protect our forests and climate by reducing our carbon footprint. GP: How did you come up with the idea? JJ: We started Q Collection in 2002 as a collection of adult furniture and textiles. It didn’t take long before parents started calling us asking if we also made children’s furniture and bedding. At the same time, my wife was pregnant and we were looking around for nursery furniture. I was incredibly surprised to see what a striking lack of choice existed. If you were looking for great design, USA-made quality and ALSO nontoxic, healthy options you were out of luck. GP: How important is it to have toxin free furniture and organic bedding? JJ: Infants and small children spend the majority of their hours sleeping in a crib or bed. Indoor air pollution is a growing concern for infants. The EPA names it as a top five area of concern and states that indoor air quality is three times worse than outdoor air quality. Home furnishings are always near the top of the list items of contributing to indoor air pollution, along with paints, cleaning materials, carpeting, etc. There are also material toxicity concerns surrounding children chewing on crib rails and sleeping on certain types of bedding. In everything we design and sell, we have completely eliminated problematic materials that are commonly found in furniture and bedding including formaldehyde, brominated flame retardants, polyurethane, etc. For more information visit www.qcollectionjunior.com.